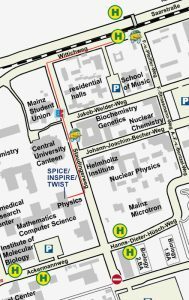 SPICE is located on the campus of the Johannes Gutenberg-University Mainz, accessible by a 30-minute train or car ride from Frankfurt International Airport (FRA). By plane: There are two airports at Frankfurt, where you possibly arrive. Frankfurt Airport (FRA) is an international airport that is about 30 km to Mainz. From the airport you can take the frequent local train service (S-Bahn) S8 (at Platform 3) with final destination Wiesbaden (takes approx. 30 minutes) or the Intercity/Eurocity train (20 minutes). Please get off the train at Mainz Hauptbahnhof (Hbf). Frankfurt-Hahn airport (HHN) in the Hunsrück region is around 90 kilometers away, where you can find Ryanair, SunExpress, and Wizz air flights. There is a bus shuttle (70 minutes) to Mainz. By train: Please get off the train at Mainz Hauptbahnhof (Hbf). Timetables are available at the travel information service run by the RMV regional transport authority and Deutsche Bahn. By bus (about 20min. ): After arriving at Mainz Hbf, please exit the station from the back entrance and head towards the bus stop "Hauptbahnhof West". From there you can take the tram lines no. 51 / 53 / 59, or the bus lines no. 54 / 55 / 56 / 650 / 75. For further information visit the website of the MVG. If you arrive by S-Bahn holding an RMV ticket it is also valid for the local bus within Mainz. Otherwise you can get a ticket for 1,70€ at the driver. Do not exit at the stop "Universität" but continue until the next stop, "Friedrich-von-Pfeiffer-Weg". The University is on the left-hand side from the direction of traffic. Pass the street and continue to the right, past the high-rise building on the left after about 150 m and then turn left onto "Staudingerweg". After approx. 50 m you will pass "Campus Döner" and the university canteen (Mensa) on your right-hand side. The Institute of Physics (Staudingerweg 7) is right after it.